A sincere thank you to Susan Harlan and Jennifer Riegler who chaired our Founder's Day program this year. You did a beautiful job and we appreciate all your hard work. Thursday was a wonderful evening celebrating our recipients. Please join us Friday at 10:30 for our Spirit Rally in the quad! Friday is also a collaboration day with early release at 11:35. Have a wonderful week and a restful and FUN Spring Break! The submissions deadline for the next Cougar Tracks email is March 27th. Read the policy/guidelines. This weekend is the last weekend to bid on summer camps, and we have added two additional camps: Speech & Debate and a middle-school prep workshop for rising 6th and 7th graders. The auction will close at midnight on Wednesday , 3/27. 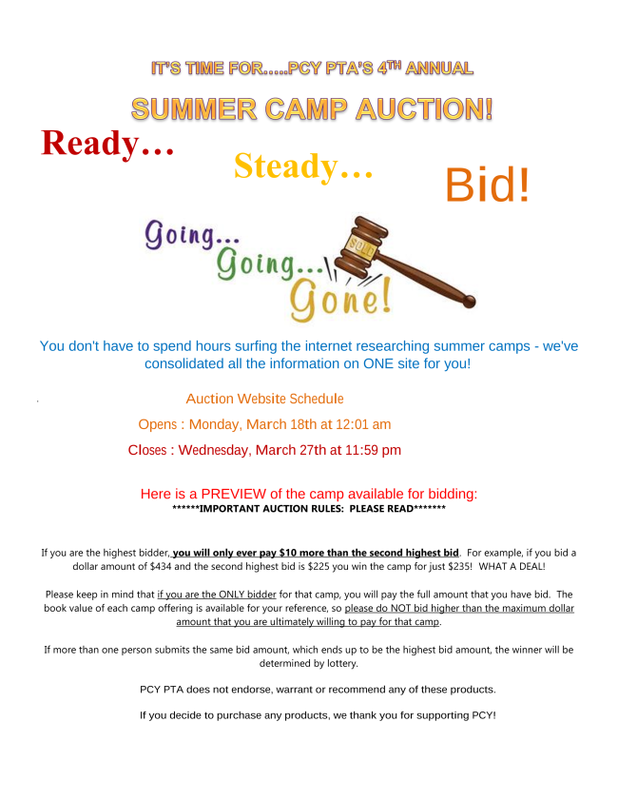 Put in your bids today on the PCY PTA website! 3/29 Spirit Rally - 10:00 a.m.